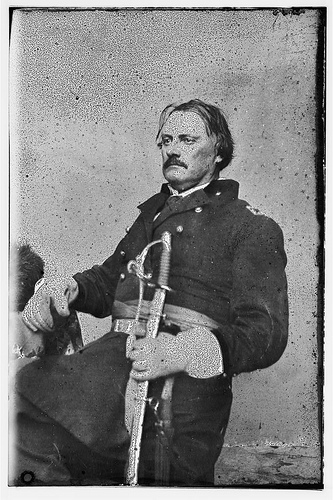 Richardson expressing doubts about his ability to command a regiment. Richardson to several of his men. Newly commissioned 2LT Richardson describing his company’s discipline problems in Florida and his soldiers ability to stretch the truth. Howard, one of Richardson’s brigade commanders sizing him up. Sumner stated in the New York Times article that announced the death of Richardson. I commend you for this hobby of yours. It must be very time consuming, but worth it to your viewers. I may be a little biased here, but after reading these quotes of IBR (which took many years of digging – which was my hobby….) you come away with a clear vision of who this guy really was; and what a shame it was that he was lost to an army so much in need of his talents so early. What a great “what if?” story for a movie. – Newly commissioned 2LT Richardson describing his company’s discipline problems in Florida and his soldiers ability to stretch the truth. Jack, I would like to add that. It is great. Is that in the book? I dont know how I missed that one. It is great. I included it. Here is a quote from IBR, if you think it’s worthwhile…”Col. Miles, having at his defense forty witnesses, will try the old dodge, that of extreme debility and sickness, and of taking opium. With the mass of evidence that I have introduced, I entertain no fears respecting myself. I wish merely to prove my own report, and beyond that, have no wish to crowd Col. Miles.” – in a letter home to his family predicting the outcome of Col. Miles Board of Inquiry after Bull Run. Thanks for that quote. Is it one in your book that I missed? Do you know the date of the letter? My apologies for not getting back right away. Is this quote in your book?